Explore the world of visualization for performance enhancement. When I saw this poster, I was vending at Franktown Meadows Equestrian Center. Hidden away, in the rest room, of all places. 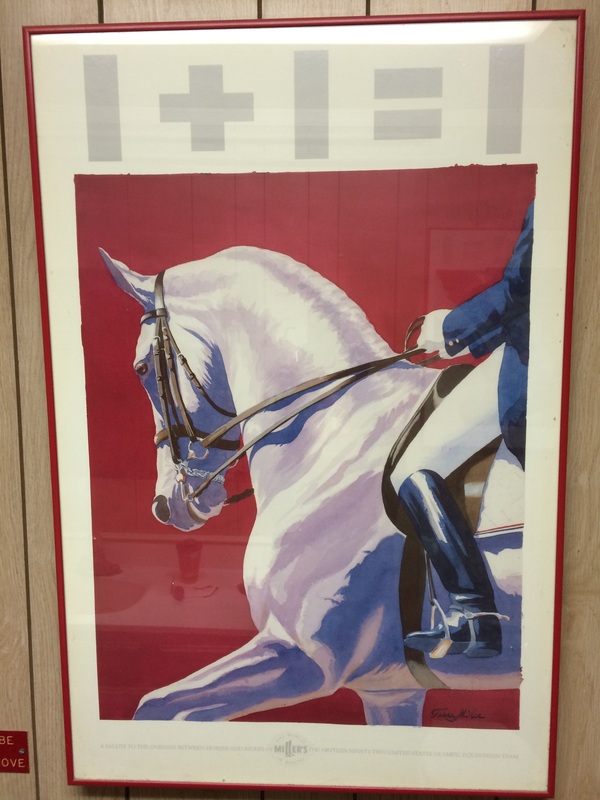 As I looked at it, the first thing I saw was the image of the horse and rider. Nice poster, I thought – though it didn’t necessarily strike me as out of the ordinary. As I registered the numbers across the top, my first reaction was confusion. What a strange graphic, I thought… And then I really SAW what I was seeing. Yes! What a fantastic bit of marketing from Miller’s Saddlery, many, many years ago. How many of us actively, consciously strive for this standard? You are one. An individual. Your horse is one. Similarly, an individual. Separate minds, separate hearts, separate energy fields, separate thought processes. On a day to day basis, you have one set of wants, needs and desires – a clean, fast round, a sparkling dressage test, an escape from the challenges of your day. Your horse? On any given day, a completely different set of needs and wants and desires. Food. A run in the field. More food. A nap in the sun. A cookie or carrot or an apple might be nice. Your worlds are linked – two, four, six days a week – training, competing. And yet, sometimes, there’s a disconnect. Two individuals – one human, one equine. As two individuals, you see that tent over there and wonder if he’s going to spook (again). He sees that tent over there and is quite certain, thank you, that it’s a monster and that you’re certifiably crazy for wanting him to go within a hundred yards of it. You feel him tensing up. You tense up. He feels you tense up and, well, we’ve all been there. I know I have. Here comes THAT jump (water, oxer, single vertical, trakhener – whatever…). Ergh. THAT jump… He always refuses at THAT jump. You tense up. You feel him hesitate. You tense up even more, stop breathing. He feels the tension, and hesitates another step. The downward spiral takes only seconds and, before you know it: a run out…a stop…maybe, occasionally, you end up in the dirt. Sound familiar? Two separate, individual minds, trying their best to communicate – and sometimes missing the mark. So let’s try a reframe. What could be possible if we could merge to that degree of oneness with our equine partner? Instead of the answer being – in simple mathematical terms – that one plus one equals two, what if the answer really could be one plus one equals one? Both of you. Confident. Courageous. Connected. Two of you, moving, flowing, being – in this moment – as one. Beautiful. Each movement, each jump, created through a mutual understanding and bond of love and trust. This is what we strive for in our riding, whether we know it or not – it’s the powerful beauty that is unique to a seamless merging of horse and rider. You understanding him, him understanding you – a true partnership. Dana Ann Dapolito is the founder and owner of Performance Energetics and Ten Simple Steps. She is a Reiki Master Teacher and Certified Success Coach, and she works with riders to understand and harness their emotional and mental selves, transmuting the bond between rider and horse. When not coaching, she competes her two horses Cody and McNaulty in the sport of eventing. Copyright © 2019 Performance Energetics, All Rights Reserved.